Jeremy and Trevor were still out of town. It was time to go get some dinner. Just me and the kids. Mama was determined not to cook tonight! I began the round up of children. Logan? check. Lizzie? check. Shoes on? check check. Now to find Jackson. I went next door to the Stoph's - up the stairs and down the stairs. No Jackson. I came home - up the stairs and down the stairs. No Jackson. Out the back door again to Grandma's house. Hellooooo??? Jackson???? No Jackson there either. One more time through the Stoph's - a deeper look into the garage and all the bedrooms. Really. No Jackson. I start to get a little panicky. Ok. He must've fallen asleep somewhere and that's the reason he's not answering any of my calls. Let's try home ONE MORE TIME. I go through every bedroom, every closet, look behind every door, and finally come downstairs having exhausted every hiding location. "Has ANYONE seen Jackson?!" I sternly ask to the oblivion. Lizzie quietly answers, "He's in the laundry room." "Yeah, right." I think to myself. Of course she says the only room I'd overlooked. I stomp back up the stairs and peer into the dark laundry room. Thinking to myself, "Why would I look there? He never goes in that room." Lo and behold, there he was! 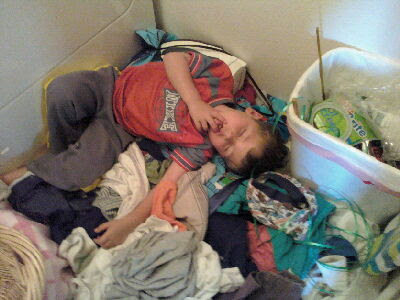 Fast asleep on top of a great pile of stinky laundry - chonis and all. Look closely and see what is near his hand. He couldn't find any of his own goo-gahs and must've heard mama's silkies calling him from the laundry room. We had lots of late nights since Daddy and Trevor had been out of town. Our sleep schedules were a little off (as well as the rest of our schedules!). Note our late dinner hour of 7PM. No wonder the child had to take an evening siesta - he was exhausted from our lack of a routine and scheduled week! Panic attack over. Total searching time: a good 12 minutes. The pizza dinner we were late for was cold, but still enjoyable because we were all there together. No children missing. Priceless. Tears are streaming down my face with laughter! so funny. glad all was well.